The Waterloo Banquet took place every year starting in 1820 until the Duke of Wellington’s death in 1852. The celebration occurred at the Duke’s estate, Apsley House, to commemorate the British victory over Napoleon at Waterloo in 1815. As you may have noted already if you have been following the Saving Samuel Godley, the Duke of Wellington played a large hand in this battle, gaining prestige and popularity that largely lead to his becoming Prime Minister in 1834. Each year, the banquet boasted of the Duke’s accomplishments, painting him as an English war hero and crucial figure in British history, despite some decline in popularity as a result of his decisions as Prime Minister. At the 1836 banquet, William Salter captured the moment in his painting “The Waterloo Banquet”. The painting portrays the Duke giving a toast as other important men and dignitaries look on. 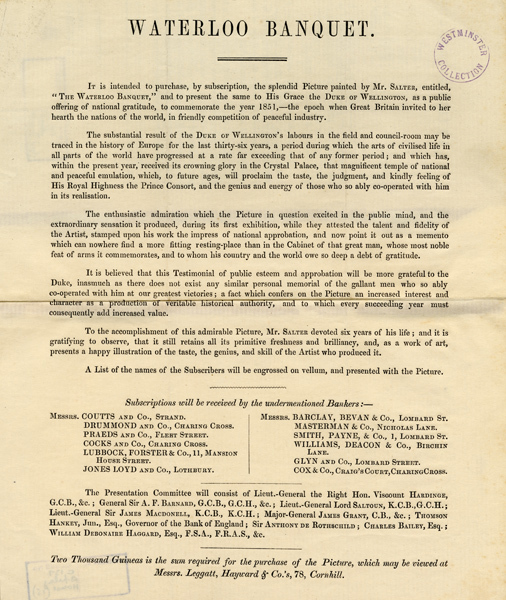 The painting was up for public purchase in 1851 and was highly prized for its depiction of the ceremony and as a symbol of British dominance on an international scale. 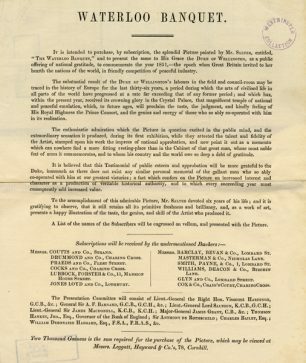 This item from the Westminster Archives collection is a circular appealing for subscriptions towards the purchase of the painting which was to be presented to the Duke. The Duke was said to have admired the painting for it was one of few commemorations of his comrades that assisted in battle and afterwards in his life of service. The public subscription failed to achieve its goal probably due to the Duke’s death in September 1852. The painting remained unsold and passed down to Salter’s heirs. Despite some controversy surrounding the Duke with his spending as Prime Minister, he still managed to maintain some popularity evidenced by his ability to draw a crowd to these banquets. However, he found followers not only in the aristocracy but also in the common English people who flocked to see this painting. 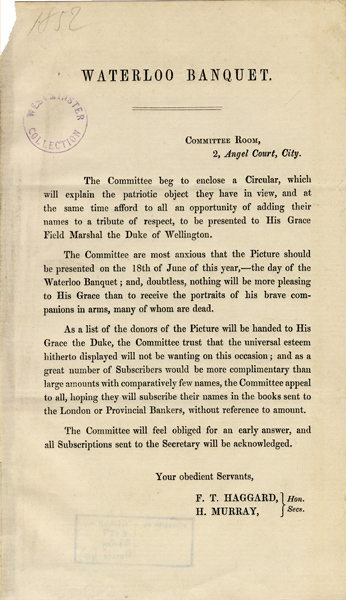 The Battle of Waterloo had a lasting impact on the English people imparting pride and patriotism in their admiration of the Duke of Wellington as a war hero. This page was added on 20/04/2017.